Jack Keech is the 303rd man to earn a coveted Doggett’s Coat and Badge. 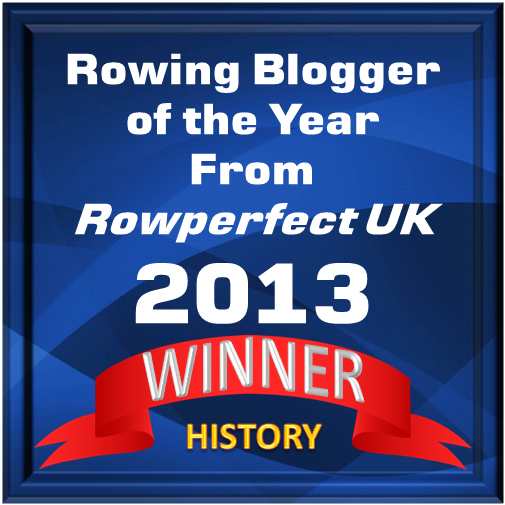 Whatever other rowing titles he will hold for a term in the future, he will be a Doggett’s Man forever. HTBS is delighted to have its 2017 Doggett’s report from distinguished rowing journalist Rachel Quarrell. Pictures and captions by Tim Koch. 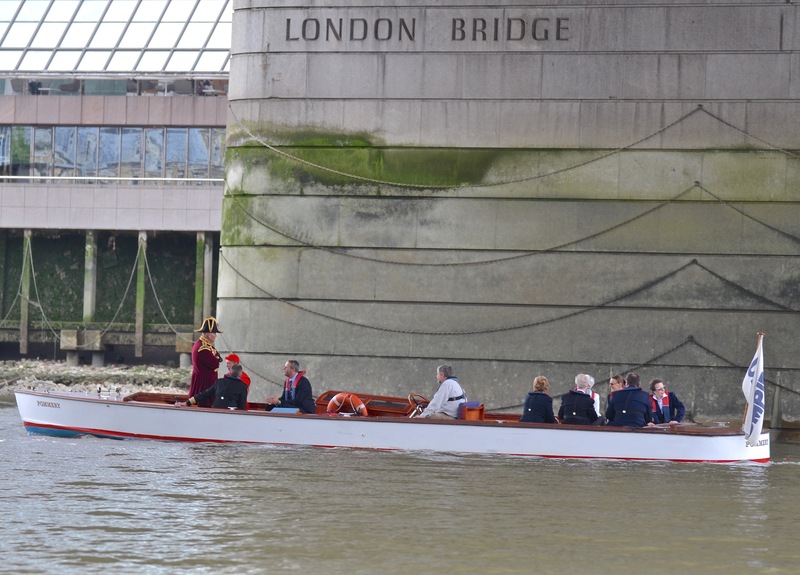 Father Thames was in his best mood for the 2017 Doggett’s Coat and Badge Race, with all-but perfect conditions as the latest instalment of an ancient contest took to an even more ancient waterway. 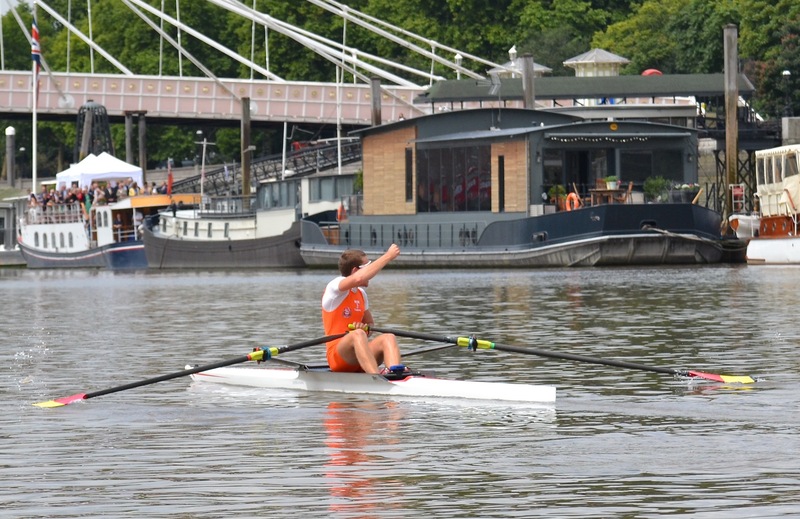 Under the fizz-fuelled eyes of a couple of hundred spectators, Olympic champion Heather Stanning and HRH the Princess Royal, newcomer and Tideway Scullers’ lightweight Jack Keech won the Doggett’s at the first time of asking, with a soaring performance which easily outclassed the other competitors. 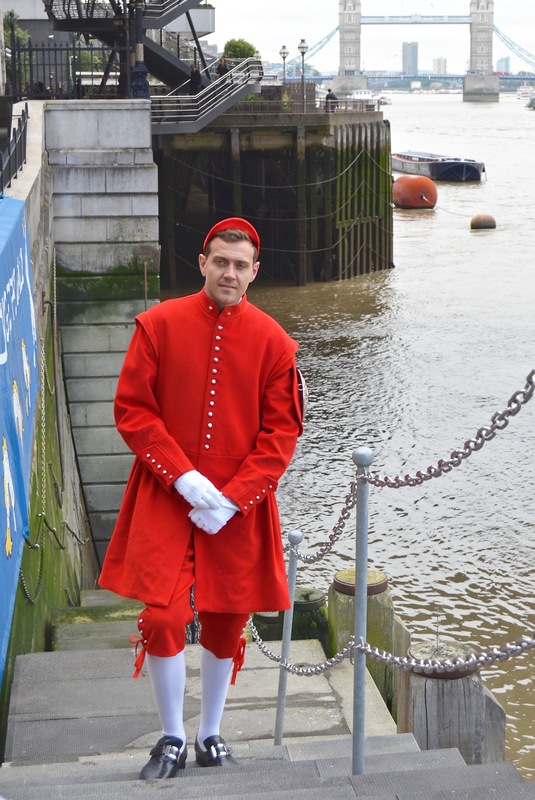 The man who won Doggett’s last year, Ben Folkard, on the river steps of Fishmongers’ Hall. Uniform boats are supplied to the competitors. 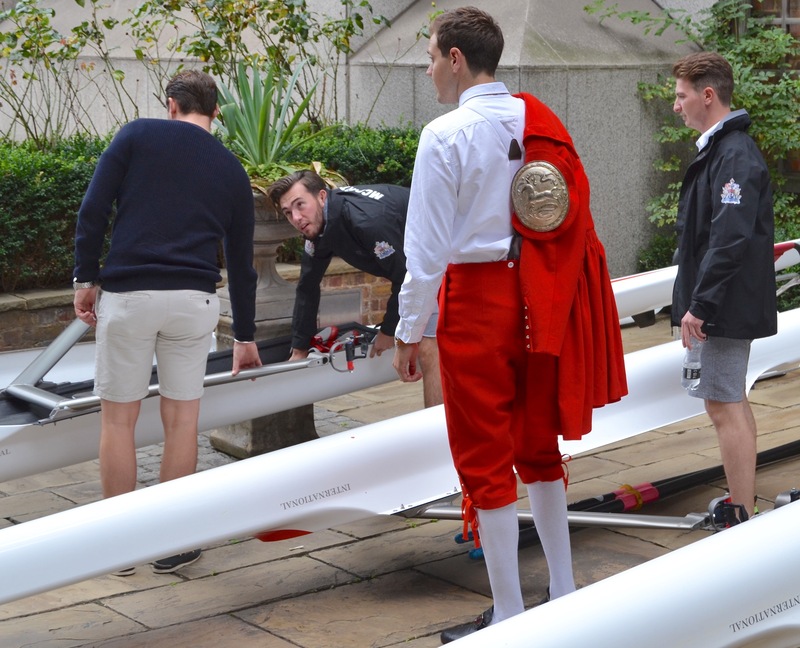 Left to right: Dom Coughlin (Doggett’s competitor 2013 – 2015), George McCarthy, Ben Folkard, Perry Flynn. 25 July dawned warm and cloudy, with by late morning a few hints of sun and the slightest of breezes barely ruffling the water. 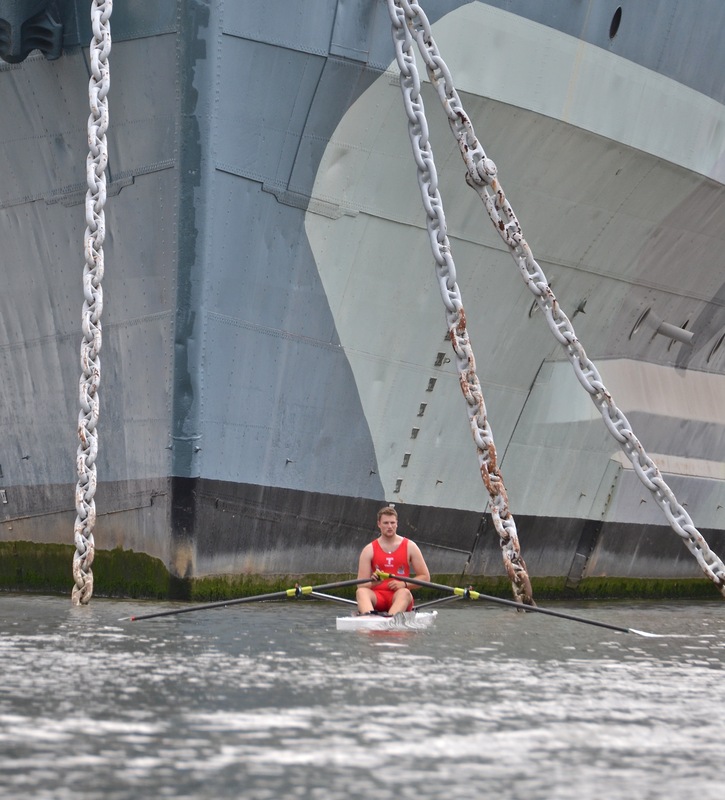 Conditions were as close to ideal as you can get on the Tideway. The four scullers – Perry Flynn in dark blue, Alfie Anderson in red, George McCarthy in light blue and Keech in orange – mustered around the bow of HMS Belfast, whose cannons had earlier woken up drowsing spectators with a bang as they heralded the imminent race. 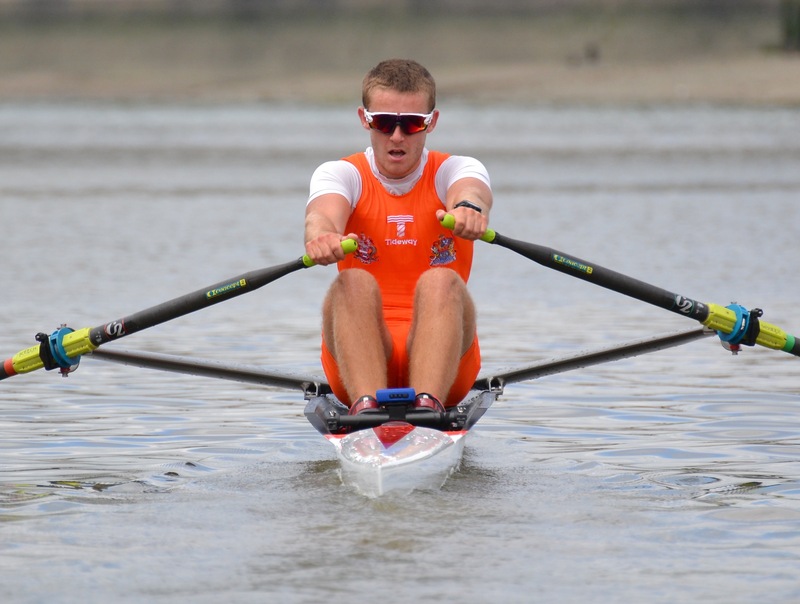 Keech, aged 22, was the only first-time Doggett’s sculler, Flynn having competed in both the previous years while Anderson won the 2014 special anniversary wager and both he and McCarthy raced last year. 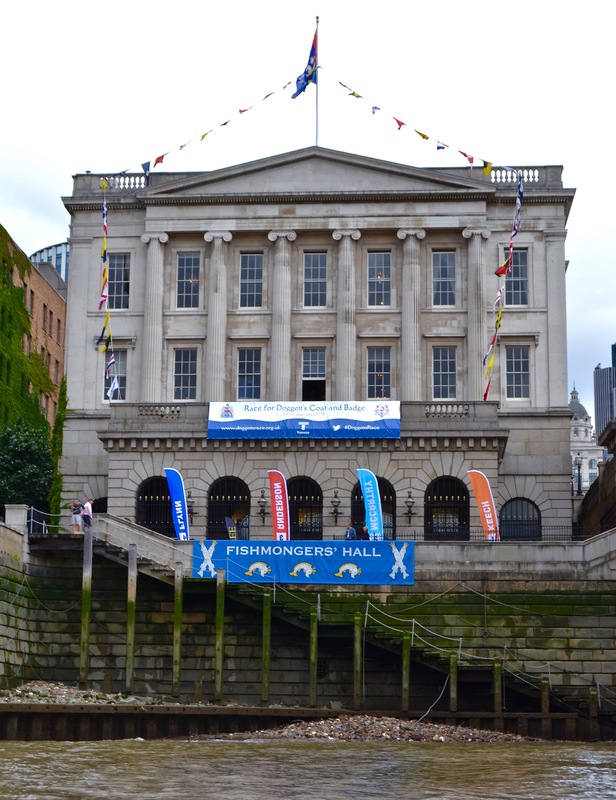 For historical reasons, the race is run by the Fishmongers’ rather than the Watermen, and it starts by London Bridge, just adjacent to the Fishmongers’ Hall. Anderson follows McCarthy onto the water. 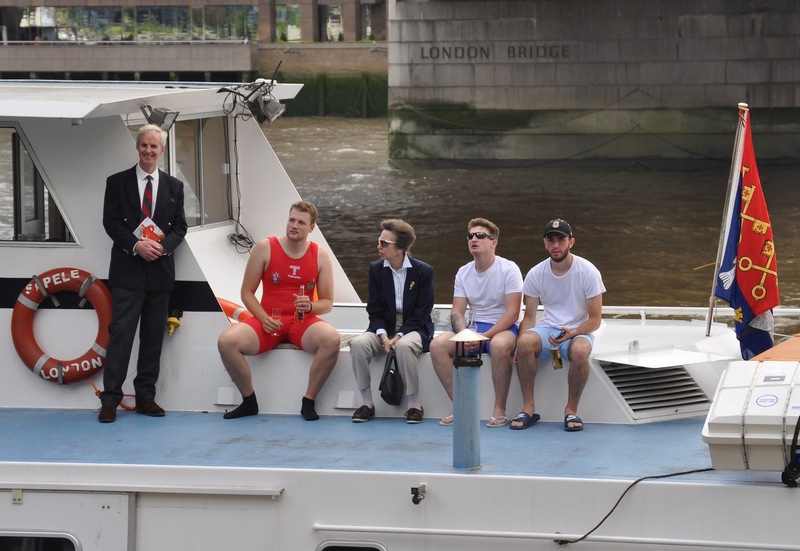 On board the umpire’s launch were dignitaries including Guest of Honour Major Heather Stanning OBE and the Fishmongers’ current Prime Warden Princess Anne. 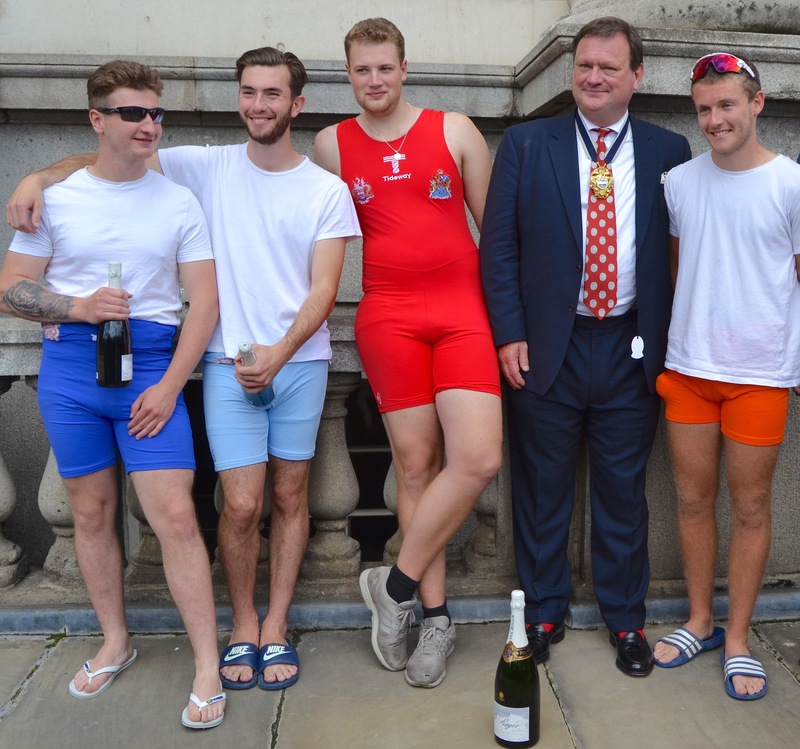 Also watching the scullers, including his young second cousin George, was the newly elected Waterman’s Company and 1984 Doggett’s winner, Simon McCarthy, whose son Harry won three years ago. 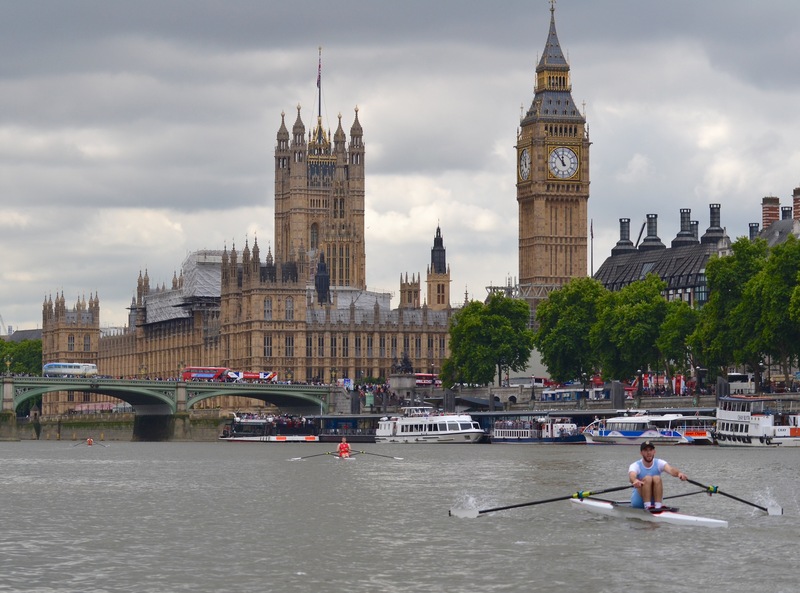 The race was filmed, partly for live streaming but also because snippets will be used in a BBC2 documentary on rowing and watermen to be screened sometime in the autumn. In the bows of the umpire’s launch in the purple livery is the Fishmongers’ Bargemaster, Robert Prentice (Doggett’s 1973). The role means that he is ex officio the race umpire. 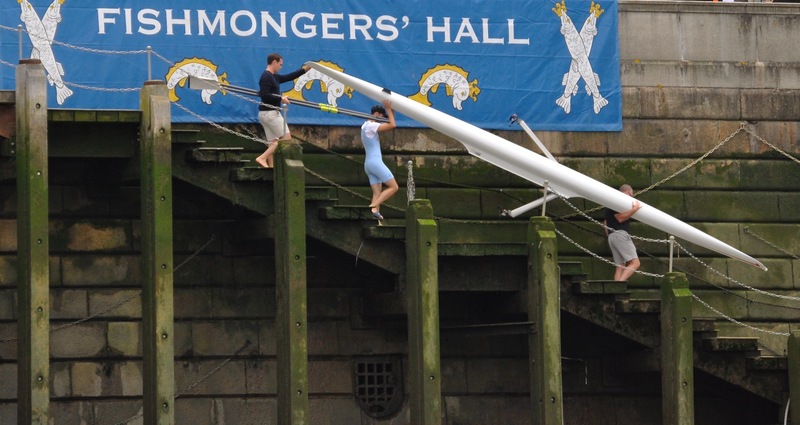 In the Doggett’s livery, Chris Anness (2011), takes the times. In the stern is HRH, The Princess Royal (formerly Princess Anne). To her right is Heather Stanning. Sitting opposite the Princess is Simon McCarthy, and next to him is the new Clerk (CEO) to the Fishmongers’ Company, Commodore Toby Williamson. 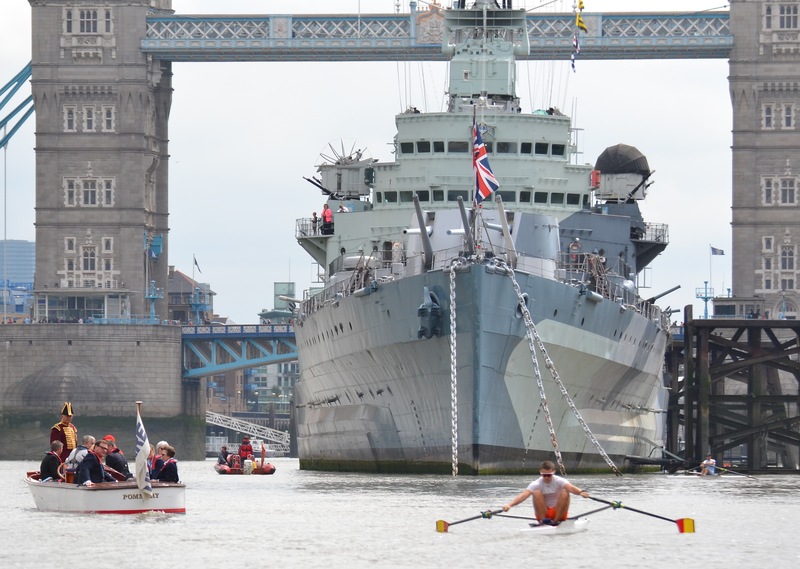 In the shadows of Tower Bridge and of HMS “Belfast”, the competitors assemble. Alfie Anderson by the bows of HMS “Belfast”. 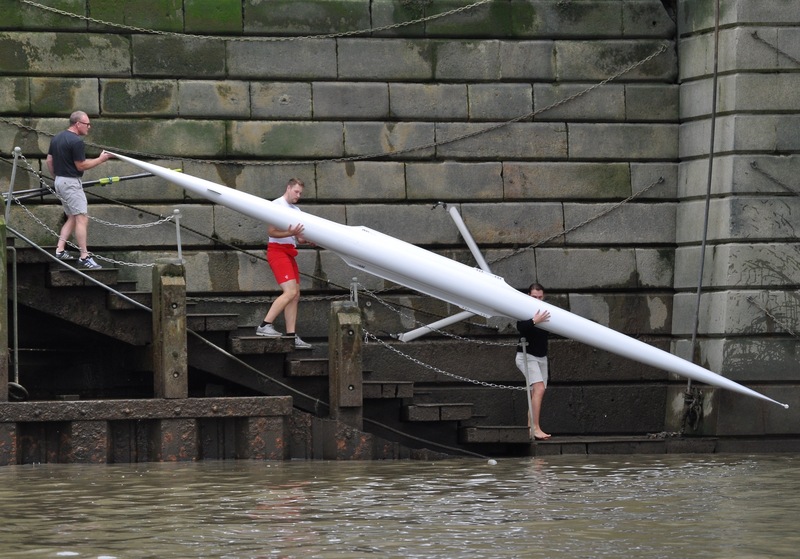 Suddenly it was 11:45, time to go, and as soon as the scullers had turned into the tide and aligned, Fishmongers’ Bargemaster and former Doggett’s winner Bobby Prentice started them by dropping a white flag. For an instant disaster threatened, as McCarthy and Keech nearly became entangled, but Keech sculled a few quick strokes to avoid contact and quickly moved off in front of the three returners. As McCarthy moved strongly towards the northern bank, Keech raced off rapidly into the centre of the river ahead of him, settling to a strong rate 33. The race is on. Left to right, south bank to north: Perry Flynn (Dark Blue), Alfie Anderson (Red), George McCarthy (Light Blue), Jack Keech (Orange). 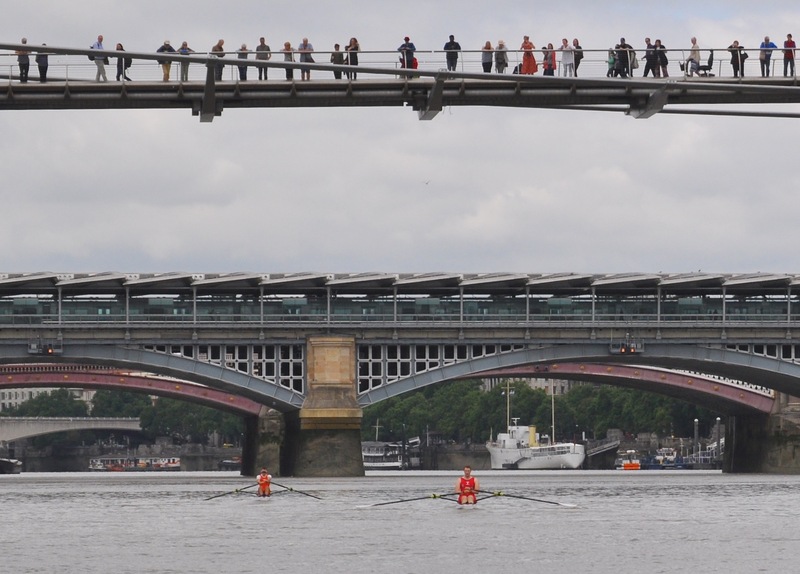 In the background is Cannon Street Rail Bridge, 250m in of the full course of 7,400m. A mere 250m in looms the Cannon Street rail bridge, and already the pattern of the race was set. Keech led, sculling powerfully and favouring the water slightly off-centre, while Anderson followed in second, Flynn dropped back rapidly on the southern shore and McCarthy was ploughing a lone furrow mid-stream but staying slightly ahead of Flynn. Before they reached the Millennium footbridge it was obvious that the race was Keech’s to lose. While Anderson used the tide well and doggedly forged on in second, Keech’s superior technique moved him effortlessly away with every stroke, and Flynn and McCarthy were considerably less confident by comparison with the two lead scullers. Passing under Cannon Street Rail Bridge and approaching Southwark Bridge (400m), Keech has already taken enough of a lead to move from his original station on the north bank to take a near centre line. Under the Millennium Foot Bridge (700m), Keech is in command. 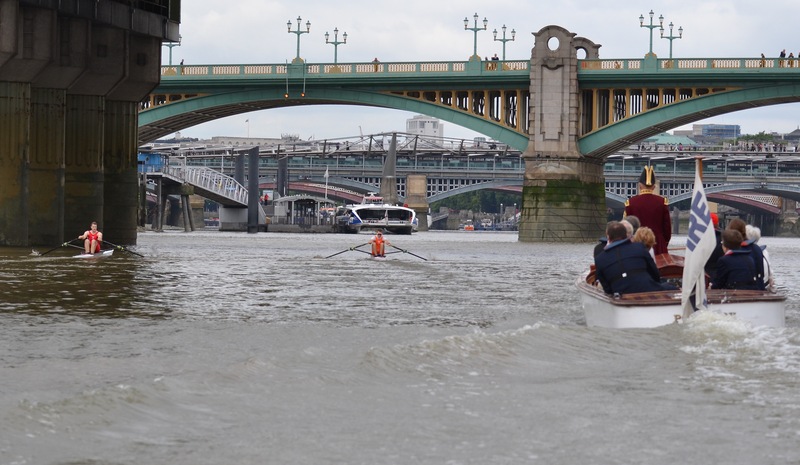 Flynn (in Dark Blue) passes under Blackfriars Rail Bridge (1,050m) and approaches Blackfriars Road Bridge (1,150m). Anderson and Keech are far ahead but, for the first few minutes of the race, Flynn and McCarthy were both contenders for third place, though McCarthy stayed on the north bank out of camera shot. 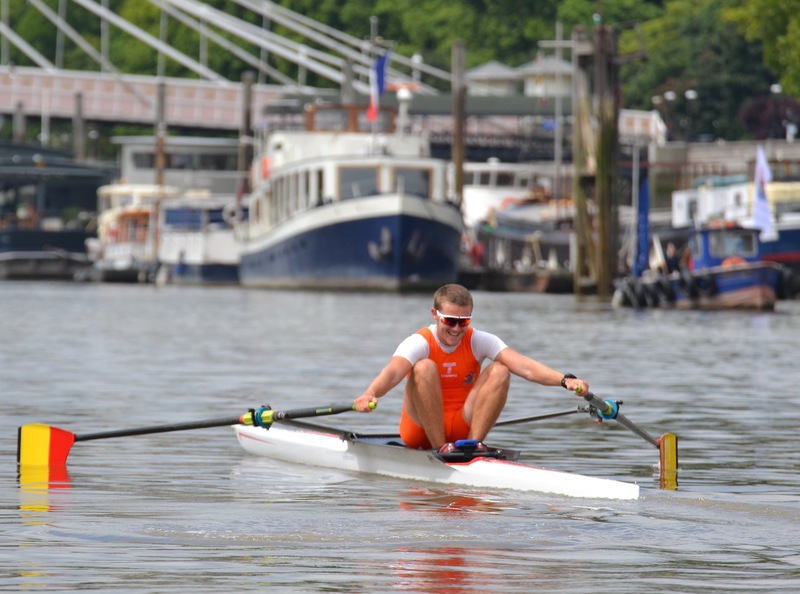 Keech proceeded to give a masterclass, having a 37-second lead by Westminster and one minute 40 at the finish. He took some possibly unorthodox steering decisions, veering inside the south-side moored barges at Blackfriars, but was followed by Anderson and Flynn while McCarthy took the more traditional centre-stream route. 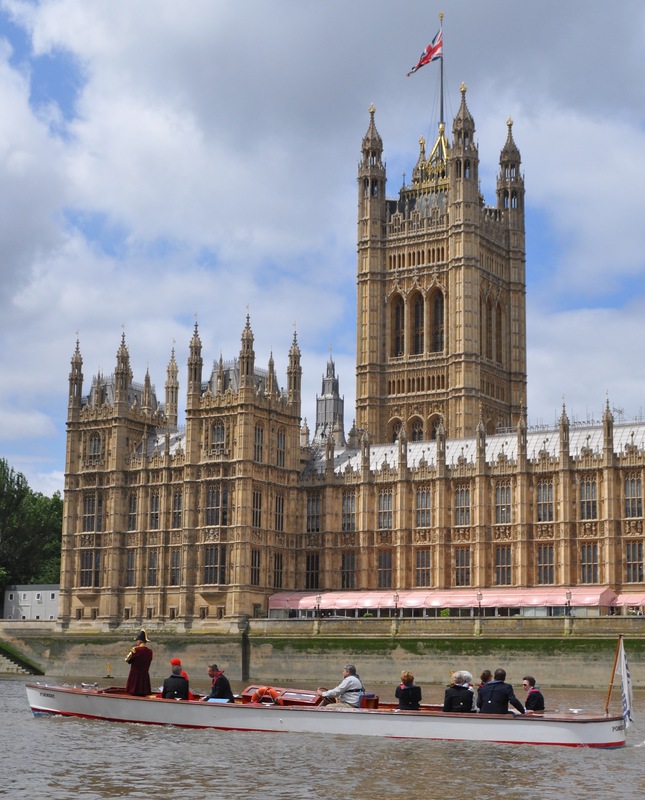 After the Hungerford Bridge Keech, now rating 26, moved sharply across to the north bank towards the Houses of Parliament terrace, off which the strains of bagpipes could be heard playing, while crowds stopped on Westminster Bridge to watch the race. Unusually for calm conditions, Flynn took the same course at Coin Street as Keech and Anderson, moving close to the south bank between Blackfriars and Waterloo. 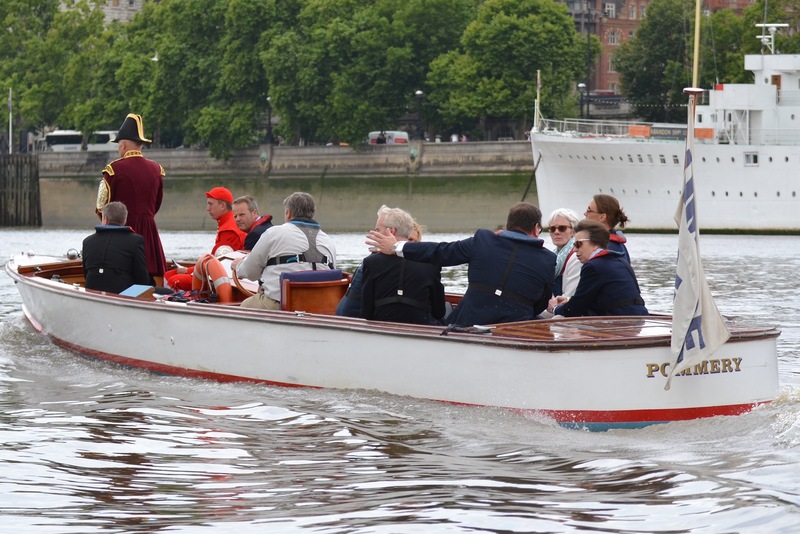 In the stern of the umpire’s launch, Waterman’s Master, Simon McCarthy (Doggett’s 1984), educates the Princess Royal on the finer points of the race. Passing the Houses of Parliament. As Keech reached Westminster Bridge (2,950m), Anderson remained in second place, but McCarthy claimed third as Flynn fell back. The Princess Royal took a picture of Parliament on her phone as they passed, a surprising act as it might be assumed that Royalty would be blasé about such a thing. 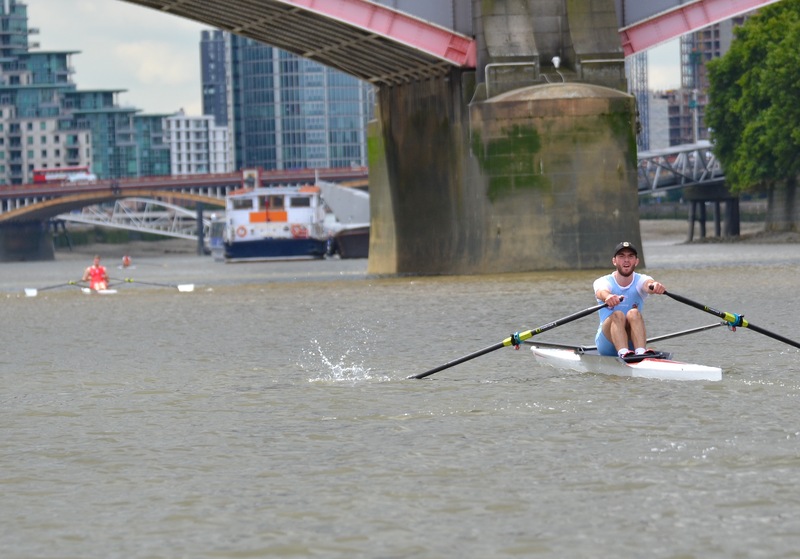 On reaching Lambeth Keech dropped his rate again, again cut the corners on the lethargic stream, but kept up a steady smooth stroke, economical and fluid. The umpire’s boat had passed Flynn by Waterloo Bridge, McCarthy after Vauxhall Bridge, and Anderson at Battersea Power Station, leaving Keech a solo coronation row to the finish line, followed only by the press and umpire’s launches along with the TV catamaran, as he sculled his way into the history books. As McCarthy and Anderson are at Lambeth Bridge (3,650m, approximately half-way), Keech is already near Vauxhall Bridge (4,500m). 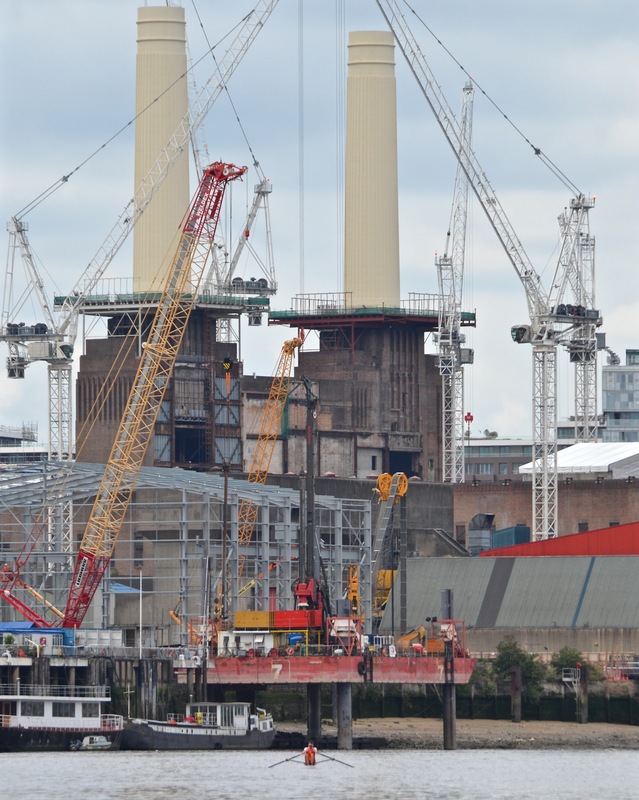 Keech at the old Battersea Power Station (5,900m). Despite his commanding lead and the calm conditions, Keech hit a few awkward strokes in the latter stages of the race, apparently suffering from back pain. Umpire Prentice holds the course record of 23m 22s. He gave this bemused look when a cry went out from the press launch to Keech that he should go for the record, which, at the half-way point and perhaps beyond, had been within his grasp. Unthreatened, Keech heads for the finish (the small boat on the right). ‘He’s a great technician – he was sliding along beautiful,’ said Bargemaster and umpire Bobby Prentice afterwards. 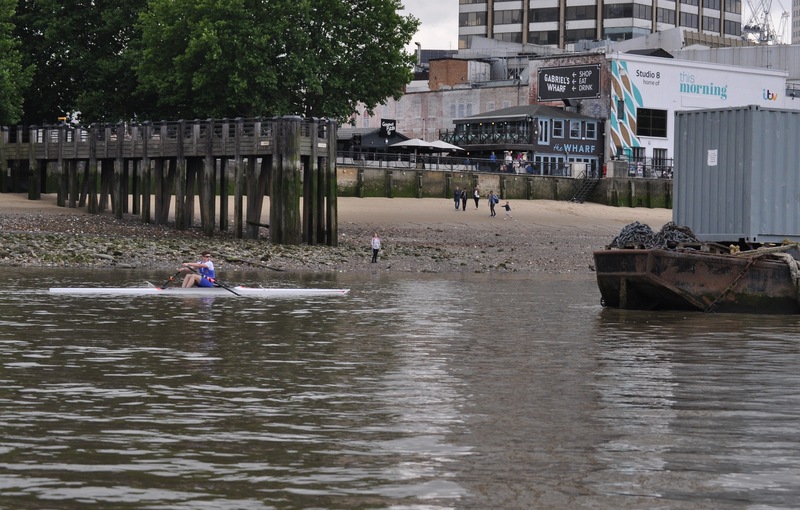 Prentice had been worried about the amount of downstream landwater slowing the incoming tide, so persuaded the Fishmongers to delay the race from the originally planned 11:30 start until the tide was definitely fast enough to keep up with the scullers. ‘There’s been a lot of heavy rain the last few weeks – if we’d gone 15 minutes earlier they’d have overtaken the tide at Westminster,’ said Prentice. It was a good decision, and yet Keech showed not only great sculling technique but also an expert waterman’s mastery of the tides, deliberately nipping into the bank whenever the shorter distance inside the tighter corners overcame the benefit of a very slow and languid stream. ‘I went over the course ten or twelve times,’ said Keech, illustrating the huge benefit of careful preparation. ‘I started pretty well and then it all went according to my race plan’. The only part which didn’t was the end, where stiff muscles forced him to drop to rate 19, putting out of reach any chance of beating Prentice’s 1973 record despite near-perfect conditions. 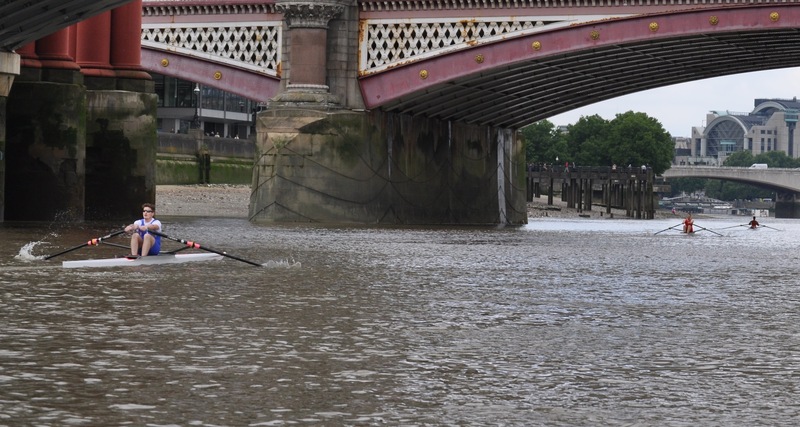 ‘I got to Westminster in 11 minutes, but after that my back tightened up too much, so I just made sure I got over the line,’ Keech explained. Wise man. At the finish, Keech let out an expletive that was audible to the Princess Royal. However, she comes from a family of sailors and may be used to that sort of thing. Anderson in second is followed in by the various spectator boats. The competitors and the Princess Royal returned to Fishmongers’ Hall on the MV “Sapele” which had been charted by the Company to follow the race. The Princess has a reputation as the most relaxed of the older, senior Royals and this informal scene seems to confirm this. Left to right: Commodore Toby Williamson, Alfie Anderson, The Princess Royal, Perry Flynn, George McCarthy. A number of stopwatches time the race, including two in the umpire’s boat (one started only after the flag has been dropped rather than on it). Oddly, despite your correspondent’s own timing agreeing with the more accurate one in the umpire’s boat, the official times cited have been given as roughly two seconds faster, suggesting they’re taken from the post-flag watch. Back at Fishmongers’ Hall, Keech is applauded by, left to right, a representative of sponsors Harold Pinchbeck, Commodore Toby Williamson, The Princess Royal, Heather Stanning. A mere 15 days after taking his freedom of the Company of Watermen and Lightermen of the River Thames, Keech claimed his place as winner of the oldest extant single-sculling race in the world. His reward was some champagne at Cadogan Pier, after the finish line (most of which ended up sprayed around), a watch from sponsors Harold Pinchbeck, an unopened magnum of fizz presented by the Princess Royal at the formal Fishmonger’s Hall ceremony, and the famous Doggett’s Coat and Badge costume, which will forever mark him out as a canny Tideway oarsman. 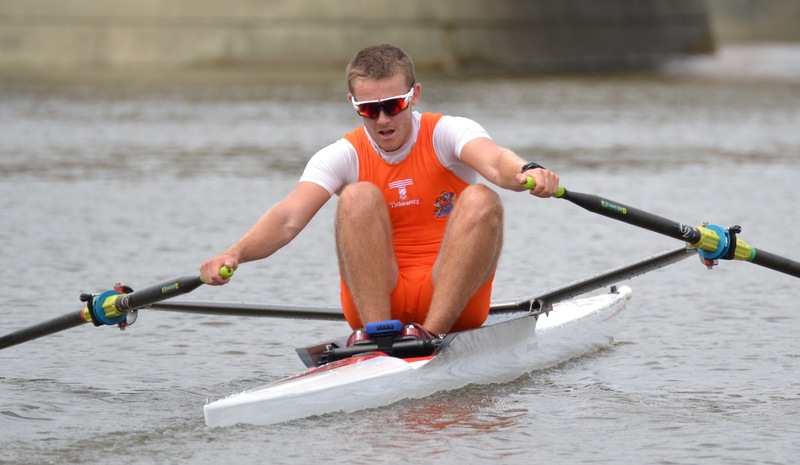 He has just finished university and plans to continue rowing for Scullers and training as a serious rower, with eyes on the GB lightweight team if he can make it that far. 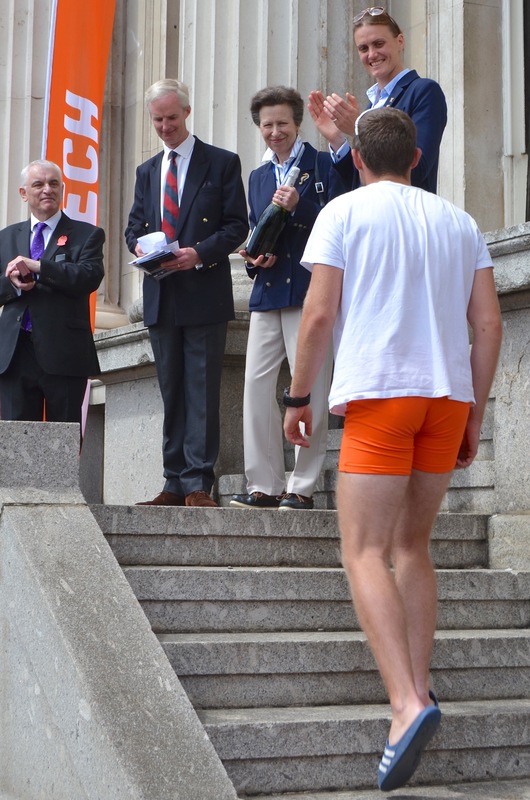 Judging by the meticulous planning, fine technique and determined racing initiative on show during his victory, we may not have heard the last of Jack Keech in rowing circles. Winners all: Perry Flynn, George McCarthy, Alfie Anderson, Simon McCarthy, Jack Keech. Text © Rachel Quarrell and Photography © Tim Koch. Amusingly, the recent anniversaries have thrown into apparent confusion which number each Doggett’s wager should be given. The first race of the series was held in 1714 on the accession of Hanoverian monarch George I, but of course that was not yet called a Doggett’s Wager so does not count. The first of the Doggett’s races was held in 1715 at the instigation of Thomas Doggett, who had founded the original, and they have continued annually in an unbroken line ever since. 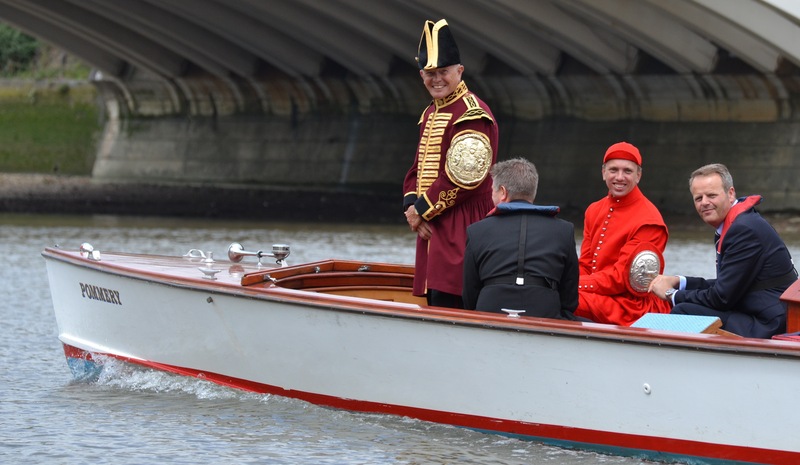 However this means that the 300th anniversary race, held in 2015, although technically the 302nd contest, was by name the 301st Doggett’s race and so the 2017 race was in fact the 303rd Doggett’s Coat & Badge Wager.